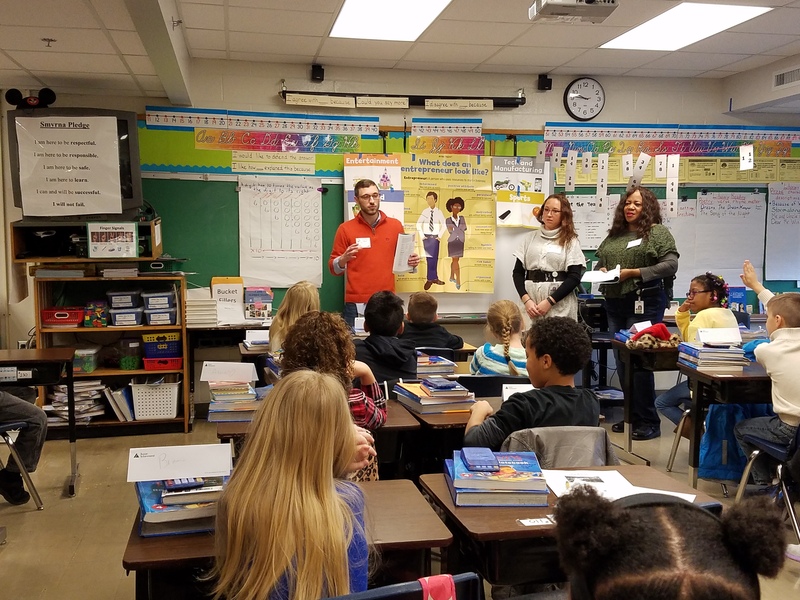 Junior Achievement’s JA In a Day program has long been a favorite for companies to participate in throughout the school year. Great team building, rewarding, and a way to bring the company name into the community are all wonderful reasons to participate in a JA In a Day. For Brad Williams from Humana, the drive to volunteer with JA means much more. “I strongly believe in the work and philosophy that Junior Achievement has. A strong passion and belief of mine is that our younger generations do not receive the financial and economic training that is necessary to live the most productive adult life that they can, and we all feel the effects from it.” Mr. Williams goes above and beyond by leading a group of more than 50 volunteers from Humana in a week long JA in a Day program at Smyrna Elementary School. With his leadership, this group brings JA programs to every single classroom in the school throughout the week. Not only do the students at Smyrna Elementary get fantastic community volunteers in their classrooms, but the rewards of volunteering far exceed the day spent in the classroom. Mr. Williams explains “Not only do I receive a great sense of personal purpose by helping to teach Junior Achievement because of my personal passions; but I get to learn so much from them as well. The simplistic and unfiltered way that their minds view this topic is inspiring and enjoyable.” His enthusiasm radiates to fellow volunteers and the students they teach, making for an amazing week at Smyrna! Won’t you consider being a volunteer who can impact the lives of our area’s young students? With schools all over Kentuckiana requesting classes, we have the flexibility to help you find your passion and use your skills to make a difference.